Mì Quảng is a noodle dish originating from central Viet Nam and is particularly well known in Da Nang. Typically it's a dish made from flat rice noodles, chicken broth, locally grown vegetables and peanuts. 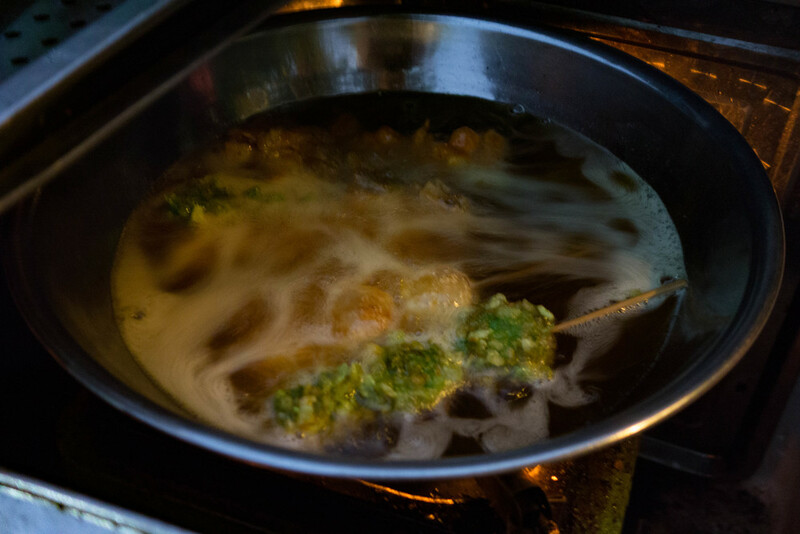 To learn how to make it, check out this article from Serious Eats: The Makings of Mi Quang Noodles. I can't stress enough the awesomeness of Mark Wiens guide to Vietnamese street food at Migrationology. It was through his guide that I found this delicious, if overly rich, banh mi pate sandwich. 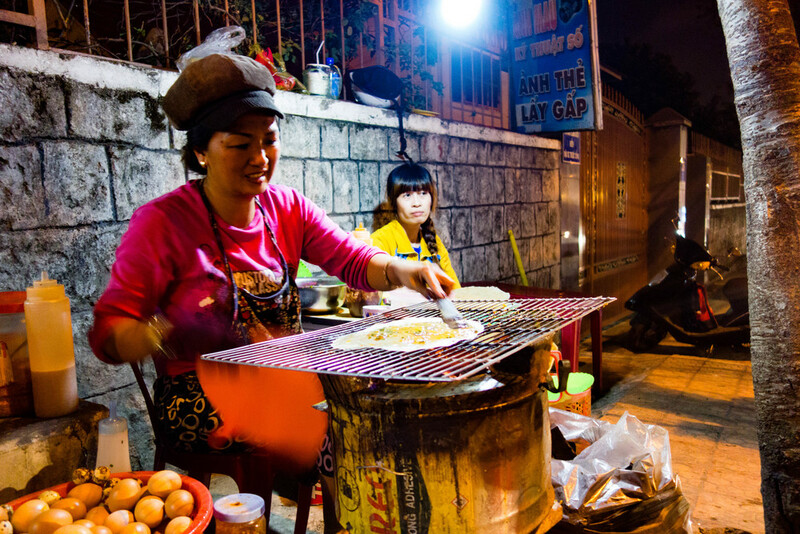 Literally meaning "sizzling cake", bánh xèo is a savory rice pancake resembling a French crepe. Typical fillings include shrimp, pork, bean sprouts, and green onion. Once the crepe is made, it is wrapped in mustard leaves, lettuce, and a fresh rice paper. Dirty dingy table and a flashing LED Virgin Mary in the corner. There's even a gnarled faced, dred locked mutant Shih Tzu napping on the coldish tile floor. I was expecting something like pho with thicker noodles, but bún bò Huế is on lemon grass steroids. 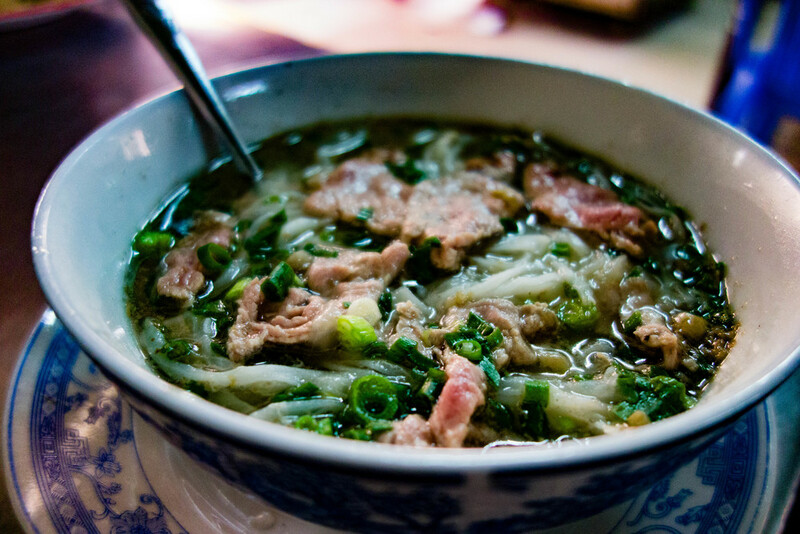 Thicker, richer, and beefier this soup is better than any bowl of pho. Have you ever eaten anything with wild betel leaves? The only time I've ever heard of betel leaves are the ones chewed throughout South East Asia that turn the chewer's teeth red, but these are not the same thing. Wrapped inside these leaves is spiced ground beef. They are then cooked on a table top charcoal grill. Other grilled items we ate in Da Lat: pig ear, bacon wrapped okra, and sausage. Hu tieu Nam Vang is a difficult recipe to pin down. 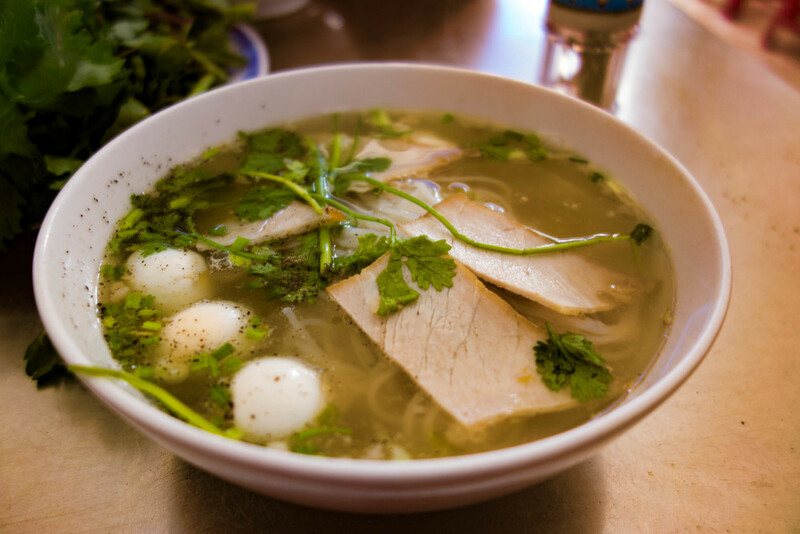 The broth we ate was delicately flavored with pork, garlic, ginger, and lemongrass, and making the bulk of this soup was rice noodle, poached shrimp, sliced roasted pork, and quail eggs. Of all the foods we tried in Viet Nam, this one captured my boyfriend's fancy. Crusty, fluffy baguette, mayonnaise, pickled daikon and carrot, fresh herbs, all topped with a couple of perfectly fried eggs. This one was purchased from a stand across the street from my cousin's apartment in District 13. Adorably small, these bite sized steamed rice cakes slide off their individual serving plates into your mouth. Ours were served topped with crispy fried shrimp and fish sauce. 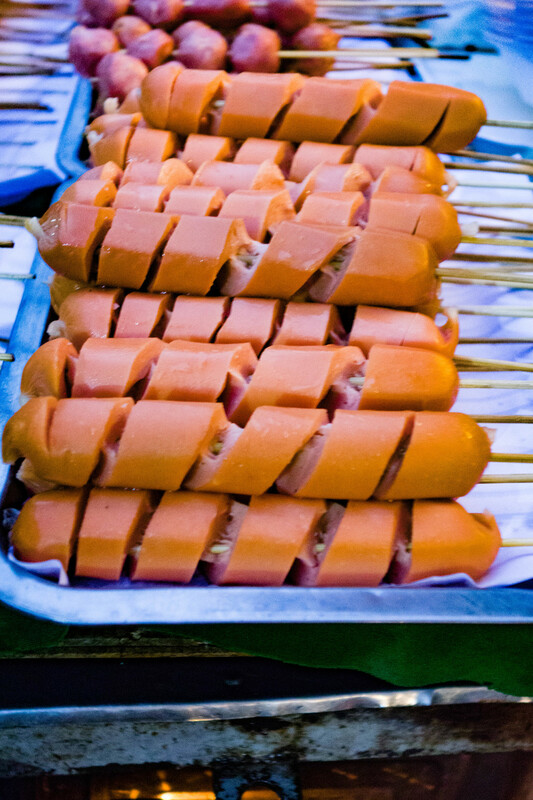 A popular snack food amongst Vietnamese youth, banh trang nuong is Viet Nam's answer to pizza. Instead of a thick dough crust, it has a base of crispy rice paper grilled over an open flame. In DaLat, as pictured here, they put Laughing Cow cheese, chicken egg, shredded beef jerky, green onion, sausage, Maggi seasoned sauce, fish sauce, and a type of sweet chili sauce. The combination is creamy, savory, sweet, and sour. Might replace Italian pizza for me. These delicious bites are what I always wanted an Egg McMuffin to be: soft, pillowy bread encapsulating a fluffy omelette like center, oh, and edible. I've seen pictures of banh can with various fillings, but the ones I ate in DaLat were spartan: rice flour pancake, quail egg center, and green onion served with a plastic bag of green onion, chilis, and fish sauce. I enjoyed these sitting on a cinder block wall, dipping these sliders into the sauce. I was actually loving it. Admittedly, this noodle dish originating in Hoi An was not my favorite at first. The noodles pictured above were disgusting: greasy, mushy, and not particularly flavorful. 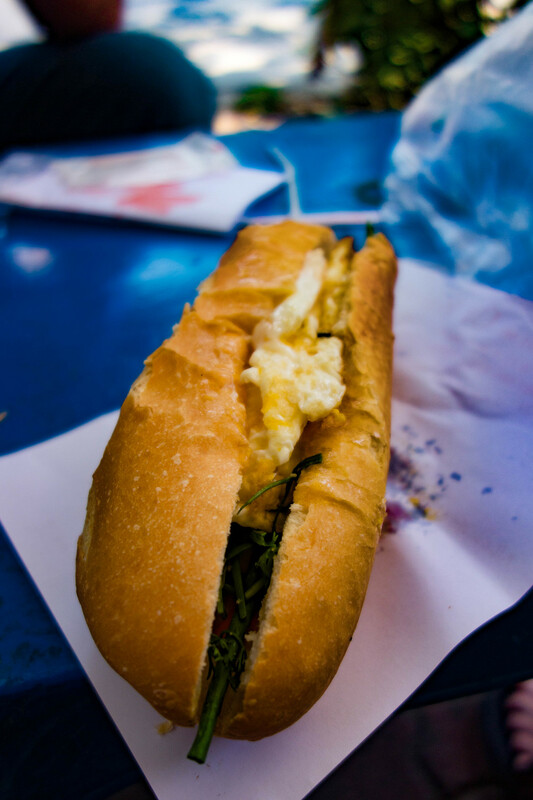 However, when I had them in DaNang they were a great breakfast. There is so much variety in preparation, quality, and ingredients, just like anyplace. Cao Lau differs from other noodle dishes in that they use lye water in the production giving it the distinct muddy brown color.